Medieval Morsels: Cauliflowers and parsnips can masquerade as cabbages and carrots, don’t you know! Cauliflowers and parsnips can masquerade as cabbages and carrots, don’t you know! Cauliflower and broccoli are rarely mentioned in Medieval and Renaissance historical sources, despite them being the two oldest cultivar cabbage varieties. Probably this is because in old writing they are simply not differentiated from plain old cabbages (or carbouches)! The same may be said of parsnips too,they are hardly ever noted in written sources, whereas the vari coloured purple, white or yellow carrot is. Once again it seems likely that the term carrot was used interchangeably by our ancestors to mean parsnip too! Don’t get me on to salsify either…. One inch scale dollshouse food by MedievalMorsels, cauliflowers on a sideboard! 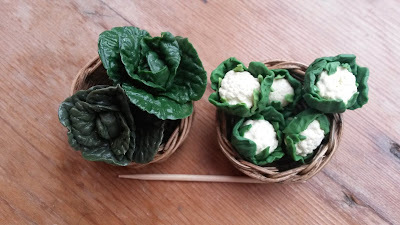 A single or more head(s) of cauliflower by MedievalMorsels will look well in your 12th scale Medieval dollshouse, your one inch Tudor dollhouse kitchen, your 1:12 Georgian or Victorian dolls house pantry, or your 1/12 American Colonial dollhouse food store. Because it is modelled with a trimable stalk you can also plant it in any period of dollhouse garden or vegetable patch! Described by Arab botanists and known to the Romans, the cauliflower (Brassica oleracea) originated as a cultivar of cabbage in the Middle East. An ancient vegetable of the (European) Old World, cauliflower has been cultivated in parts of Europe from the 13th century. It is known from Arab writings in Spain, and was well known in England by the 1500s. Its old English name “coleflore” means cabbage flower. According to Lorraine Harrison in her book “A Potted History of Vegetables” the English herbalist John Gerard in his “Herball” printed in 1597 advised that the “colieflore” (spelling was not a precise art in the Middle Ages or Renaissance times) should be sown on a pile of dung in early Spring. Cauliflowers were introduced to France by the Italians (Genoese) via Cyprus in the 16th century but they did not commonly appear on noble tables in France until they became all the rage at the court of Louis XIV. So the cauliflower a very appropriate vegetable for MedievalMorsels to model, here with its green leaves trimmed back to reveal the white “curd” or flower. The flower head remains white because protective leaves growing around the head prevent chlorophyll being formed, keeping the head from turning green. It’s the same effect you get by earthing up leeks and asparagus to get white growth. 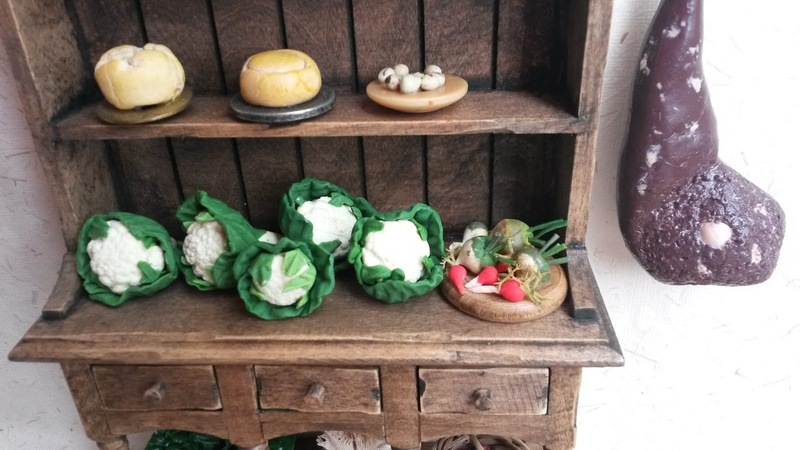 And, just for completeness, here are some 1/12 th scale cabbages and parsnips by MedievalMorsels for good measure seen alongside C18/19th Flemish illustrations.